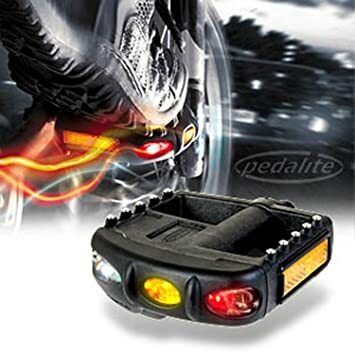 The Pedalite dynamo pedals are battery free pedal lights that keep you safe. The pedals make cyclists visible to bigger vehicles and avoids collisions. The cyclists can be made visible upto a distance of 1 km and from any angle! The Pedalite dynamo pedals are called 360 degree lights for this reason. Though dynamo power systems have been used in cycles before, they are unique in their power harvesting and storage. LED lights are used in the Pedalite dynamo pedals which are even better than CFLs. LEDs need lesser energy. The Pedalite dynamo pedals store the rest of the energy using some capacitor or other energy storing devices and this enables the lights to be visible even when the biker is at rest. The lights of the Pedalite dynamo pedals would last for over 5 minutes at rest. Regulation requires you to have luminescent tapes or reflectors on pedals to increase your visibility while cycling. These can be viewed from the front and the back. The dynamo pedals from Pedalite can be seen from any direction! They can avoid accidents not just from the front and the back but also from the sides. They are very light weight but sturdy. The Pedalite dynamo pedals have good grip for any kind of shoes and they fit on almost any bikes. Additional clippers are also available from Pedalite. The Pedalite dynamo pedals have white, yellow and red flashing lights. The pedals have tendency of getting flipped over which you can get used to in a while and some experienced bikers found it easy to not let them flip. The tough and durable materials used to make the dynamo pedals makes it free for rough use. The reflectors used on bike pedals may make them visible when in motion due to the up and down movement of the pedal creating and orange blur, but when the cyclists stops at junctions, it is harder to spot them. The Pedalite dynamo pedals can help in such cases as they will keep flashing a warning. Most of the reported bike accidents have occurred when the cyclist has stopped at junctions. The Pedalite dynamo pedals are cleverly designed and easy to use with good storage capacity. They are the perfect choice for bikers who are looking for energy efficient bike pedals.